We hope you're seeing a pattern here. 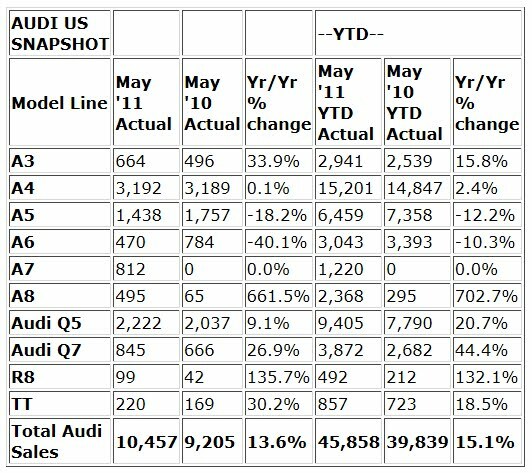 Marking the fifth "best-ever" month this year, Audi of America is reporting record results for May U.S. sales. In addition, May 2011 becomes the third-best month in the brand's history. 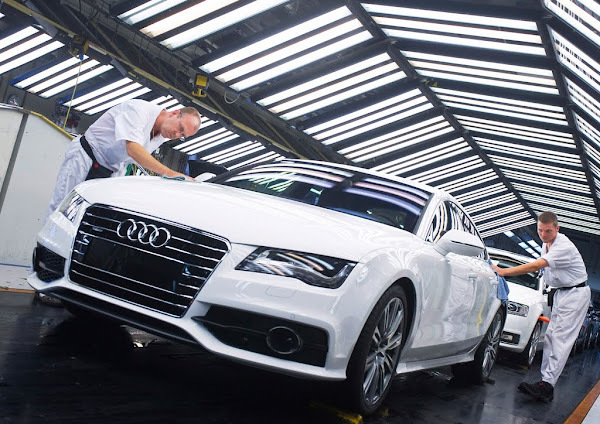 Like April's report, May's record numbers were highlighted by sales of the all-new Audi A7 Sportback and flagship 2011 A8. Audi USA counted 812 A7s and 495 A8s sold for the month; chalking up a 661.5% increase for the A8 over the same period last year. Full report after the jump. Jun 1, 2011 , Herndon, Va. - Audi today reported its fifth-consecutive record-setting month for 2011 with the best May U.S. sales in company history. Last month, demand for Audi luxury vehicles increased 13.6% to 10,457 vehicles sold, from 9,205 vehicles sold in May 2010, marking the third-best month in Audi of America history.